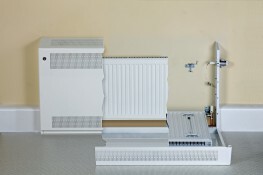 Contour Heating Products Ltd > News > Are LST Radiators Efficient? In schools and hospitals, as well as in other healthcare environments, there is an ongoing effort to create more cost-effective solutions for the operational side of the establishments. Heating solutions are often seen as a high-cost expense and there is a growing concern about the efficiency of LST radiators because many spaces require maximum levels of cost-effectiveness while maintaining the best standards. If there is an excessive amount of lost heat or a serious inefficiency around LST radiators it can result in larger heating bills as temperatures are cranked up to reclaim what is lost through the brickwork. In schools and hospitals, tight budgets mean that there must be serious efforts made to ensure that heating standards are not draining the finances that could be better placed elsewhere. Some radiator covers are efficient because they offer as little as a 5% reduction in their heat output, however, they aren’t always suitable for places catering to vulnerable people as they have many free areas that allow heat to flow into the room. These areas become risk points for items being pushed through, fingers being caught and the potential for them to be used a ligature point. As a result, LST radiators should be designed to maintain safety as well as low surface temperatures and efficiency. One of the primary benefits of Contour LST radiators is that they can be cleaned much faster and on a lower budget than a traditional LST. Using RotaRad valves, Contour LST radiators are designed so that they can be accessed and cleaned by just one person in ten minutes, whereas a traditional LST radiator can take two people up to thirty minutes. The benefits of this are that the LST radiators are cleaned faster and require less people-power. The cost saving that this generates can be put back into the facility to be spent on more equipment or staff. According to BestHeating around 45% of heat is retained using the proper insulation on a radiator cover. In order to ensure that the heat generated by the LST radiator isn’t lost into the brickwork or the walls behind them, Contour LST radiator covers are coated on the interior with Kingspan foam. Kingspan works by reflecting the heat that would have otherwise been lost back out into the room. This prevents loss of heat that would have occurred without it and gives a better heat output. Contour LST radiators are efficient because they offer a number of features such as Kingspan foam and easy access that means there is minimal heat loss and they can be cleaned faster. The benefits of more efficient LST radiators are that they can relieve the pressure on costs and allow for more freedom for staff as they take less time to clean meaning more important tasks can be undertaken. 99 specifiers have shown an interest in this product the last month.